Last month, 25 associates from a software company, Laserfiche, joined Habitat for Humanity of Greater Los Angeles (Habitat LA) for a team build day in Long Beach. While the team learned that building software is very different from building homes, they used different tools, including hammers, nails and paintbrushes to help create safe, decent, and affordable housing for families. Laserfiche associates worked in teams to complete a number of projects including constructing fences, digging trenches, applying caulking, installing blinds and putting the finishing touches on the exterior paint. While the Laserfiche team was familiar with Habitat LA’s mission, it was many of the employees’ first time participating in a build. “Just knowing that we’re having an impact on the community and that Laserfiche is supporting that endeavor really makes me proud to be a part of the company,” said Jen Castro, from Laserfiche’s human resources department. 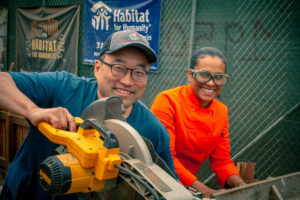 Laserfiche will join Habitat LA for three more build days in 2018 as part of the company’s ongoing corporate social responsibility initiative, Laserfiche Cares. Take a look at all the fun the Laserfiche team, watch the video. To book a team building volunteer day for a corporate team visit here.